An expert in the construction of traditional cellars for over 20 years, Degré 12 is also a pioneer that has brought a new way of thinking to cellar design, bringing wine storage right into the heart of the home and turning bottles into works of art that we enjoy exhibiting and watching them as they age. Degré 12 will turn your wine cellar into a convivial meeting-place that combines design, luxury and refinement. However, design is only the tip of the iceberg: there’s also a technological challenge. All the techniques used to regulate temperature, humidity and lighting have to be built in invisibly and they all have to work silently in order to integrate unobtrusively into living areas. We work with the very best craftsmen and technicians who are experts in their field. This is a guarantee of consistent quality. All the components of the wine cabinets, cellars and spaces that we make are tailor-made and assembled by us. Innovation is a constant concern at Degré 12: we are always looking to develop new storage and layout concepts to meet the needs of our time. People are no longer just showing off their wine, they’re showing off their cellar too… They’re creating a “wine space”, an innovative concept that’s made possible through the development of totally tailor-made metal frames and doors. 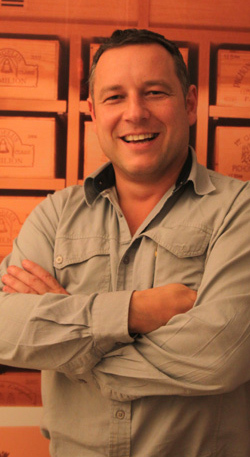 A passionate, creative wine and food-lover, Nicolas Francart designed his first wine cellar in 1995 and founded Degré 12. Over time, he completely redesigned and irreversibly changed the way in which wine may be stored and exhibited. The creative driving force behind Degré 12, Nicolas is involved in every phase of a project, from the initial design to the final installation on the customer’s premises.